← I’m Back…What Do You Mean You Didn’t Notice I Was Gone? SKYLIGHTS – Have you ever been in a room with skylights during a storm? It’s the worst. We have two in our family room, and, no kidding, you have to set the volume of the television up to ear-bleeding levels in order to be able to sort of read the actors’ lips. We also have one in our master bath, which would be awful if we didn’t employ the use of a fan to provide white noise during the night. The worst. TWO-STORY ROOMS – Yes, they can have a dramatic effect, but have you ever thought about the cobwebs that collect waaaaay up there? I find I’m absolutely obsessed if I notice one hanging when friends are over. Sometimes, the light shines juuuuussssst right to illuminate the hanging dust bunny. And speaking of illumination…whose idea was it to install recessed lighting on a ceiling that’s 20 feet tall? Seriously? This is kind of like two construction pet peeves in one. We have so many light switches on the walls for the various lights, ceiling fans, etc. that, to be honest, after twelve years of living in this house, I still have to flip about three of them to get the one I want. But, the one switch I know for sure I never want is the one which controls the recessed lighting closest to Venus. It doesn’t really matter, anyway, because the bulbs burned out about eight years ago. Oh, and another thing…have you ever tried to paint a two-story room? If you’re smart, you’ll say, “Are you crazy? That’s what professionals are for” And, let me tell you, it is so worth the couple thousand dollars to hire someone to do the job. I know you’re thinking, “Wow, she must be really rich, to which to which I would answer, “Rich as in wealthy? No. But, rich in friends and family? Yes. In other words…depressed as hell.” Anyway, back to the painting…my sons recently painted their grandparents’ two-story living room and they learned that they never, ever want to be painters. Ever. One day, while in church, I noticed a man with enormous ears sitting in front of me. He was an older man, so I thought, you know, he’s old, what do you expect? Old men have big ears. But, then, one thought led to another, and I wondered…do ears continue to grow? And only in men?? I suppose I’ve seen old women with big ears, but as I searched the pews, I couldn’t spot nary a one. And then, I thought…well, they must continue to grow because in my search for a humongous eared old lady, my eyes spied several teen boys and young men and they all had normal-sized ears that seemed to fit their heads quite nicely. So, I guess I’m just left with…what’s that all about? There are other odds and ends rummaging about in my brain, but I just thought I’d share these with you. And include in this post an equally random picture I found amusing. Your welcome. 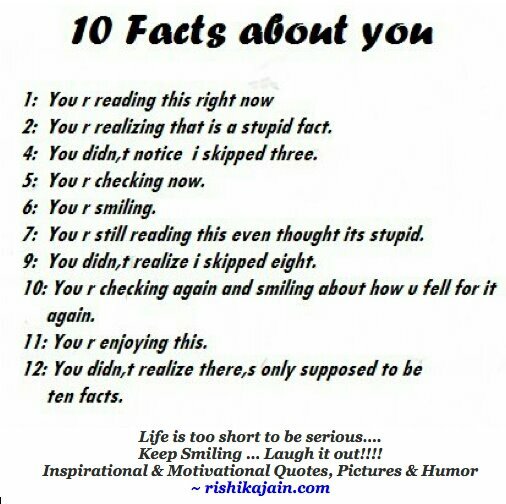 Not only did i see what you did before you corrected me I also caught that there were in fact 10 facts because you skipped two and had a total of 12 facts meaning you did rightfully give 10 facts to someone who fell for you tricks unlike me and the others who weren’t as wise enough.